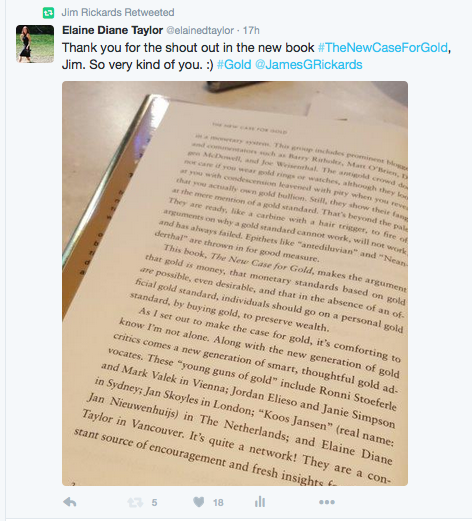 An article synopsis of Jim Rickards, New York Times bestselling author of The New Case for Gold, The Death of Money, Currency Wars and The Road to Ruin, with Alison Vekshin of CNN International. We work as closed system groups and as individuals, and the power of us humans is that we can join and leave a group for strength or individuality. This plays a big part in our microcosm lives and macrocosm environments. Including world trade. Looking at who joins with whom tells us how strong they can be as a united force, and how quickly they can move. That’s quantum mechanics right there in literature. Quantum meaning a quantity. A group of some things working as one. In quantum physics, you can never know what an individual particle (or person) will do, but you can know with quite a lot of certainty what a group acting as one closed system will do. The group has economies of scale by sharing resources and moving as one large unit, and yet there are diseconomies of scale where as an individual you can make changes faster, and be more nimble and innovative. We all give up personal freedoms to get the advantages of being in a group. We all have seen or been part of a closed system that uses persuasion to gain members and strength. We’ve seen or been a part of abuses to the mind in order to try to keep individuals in a closed system against their personal interest. As the closed system we call nations has evolved, we come to the stage in the rise and fall where those with power inside the system loot for their personal benefit with almost no fear of consequences. Those at the top cover for others at the top, or else the whole system will come down and they’ll be worse off. They can be threatened by others at the top if they leave the system and expose the looting. Once the system is so broken it can’t sustain itself you have two choices: you loot the hell out of it and leave before the masses find out, or else you build a new system without alerting the masses that they’re being sheered like sheep. If the masses act as one for their group benefit they’re more powerful than the elite working as one for their own benefit. But it’s tricky to get the masses to agree on anything. Those with power must keep the larger group confused, angry, tired and without hope. The current system loots of the host masses like a virus – about to kill the host and move on. But it’s now trying to create a new system where it’s just a parasite – feeding off the masses in a slow drain that doesn’t kill the host, it just takes it’s resources without being found out. So the looting usually drains the system from within until the group is either too weak to withstand an attack from without, or else the smaller sub-groups inside the system see the lack of leadership strength and fight with each other for resources. Either way the system no longer lives the way it did. It’s gone. The host masses just aren’t aware yet because they’re promised payment in the future. They have no control so feel they have no choice but to trust the words of the virus that’s feeding off of them. It’s lately been called ‘gaslighting’. Convince the victim that what they see is not what is really going on. Keep saying it and persuade them to stop trusting their own judgement. Here comes the power of media. The power of persuasion. The power of media’s “one-to-many” mainstream being controlled by a handful of individuals. The advance in digital communication makes the idea of physical nations based on geography much less of a thing. An individual can physically reside anywhere on earth or off geographically and yet be connected as a unit with someone almost anywhere else. Physical capital as a nation’s advantage is not longer as big an issue. People move and their presence can move instantly. A presence in the digital world needs a medium, being electricity, just as a presence in the material world needs air for sound waves and bodies to move.. Humans have moved on now from using air with sound waves and physical clubs and fists to dominate, and then to written symbols and the printing press to dominate ideology and group masses for strength, and now on to electricity and the instant movement of images, sound and symbols. Communication no longer moved in a linear narrative of words and story down a ribbon of highway like a car. Electricity has brought us a field all at once. The switch is turned on and light all around, with its visual input, is all at once. Materials have become digital and can move all at once. Including money. Haivng control of the movement of the fastest communication always gave control over the larger group. The British Empire controlled the shipping lanes and had the ruling empire of their time. The United States controlled the air and had the ruling empire of that time. New technologies have developed to take us out into space. Who will rule space as humans expand into a greater geographical area? There is a race going on between nations and a few non-nation state actors. Money is a symbol of communicated value. That’s what it is. It’s a physical or digital object as a unit that is compressed in time and space so we can communicate and trade it. Money has changed as communication has change. From feathers to shells, to gold to paper to electronic digits. But the movement of the communication of value that hasn’t changed. Do we trust it? It only works when the majority trust the system. A government creates fiat currency to move it’s money. It used to move physical money and then discovered that the threat of force and the confidence in the ability to play out that force means a piece of paper with a number means it represents that unit as stated. Fiat means a thing is created merely by the statement that it is. A government has the power to do that with money. Our individual power joined with others is the power of the group. Strong individual equal a strong group system in the long term. As the system goes through the cycles of expansion and contraction, around the seasons of a spring, summer, fall and winter, the individuals alternate between individual advantages of quick movement and innovation for the benefit of the group, to acting as one for the group advantages of bulk strength and shared resources. Here’s the problem we’re looking at in the current ruling empire system. Individuals with power have looted for personal gain at the expense of individuals with less money and power. If you do this for too long the system collapses from exhaustion. A normal contraction in the market was diverted in 2008 by those with power, so that they could individually still accumulate at the expense of the masses. They created artificial money not backed by the production of the masses. In effect borrowing from the future. They created a debt obligation and not actually money – just a promise to finish the transaction in the future with money. It’s obligations backed by obligations backed by obligations. And at the end of the line is the nation’s ability to settle the obligations with the very material they all trust – gold. Just gold. They added time to the envelope containing all the world’s GDP value. Then they added bets on the delivery on time. Then bets on the bets. The derivatives in the financial world have created obligations that can’t be paid off with the current system. There isn’t enough gold to settle it all. Or rather, the price of each unit of gold isn’t high enough to cover the promises. Because the system is based on fiat, meaning a declaration based on confidence that the ones creating the money have the power to do as they say, it means there must be confidence in the future ability to pay. Do we have confidence in the future ability to pay up? If you make the pie bigger. You could fly into space and harvest the asteroids, creating more physical material and GDP and then the current system could keep going. Hence the new space race. If you can’t bring in the space metals fast enough to pay enough debt to make a critical mass of humans feel secure then there will be a problem. There is so much debt in the global system that there is not enough ability to ever pay. Too many promises and not enough trusted money to fulfill. So who will get what was promised and who will be left with nothing? The ones who see how many pieces of pie are left in the pan and how many have been promised, and take the pie on a plate instead of a future promise for a bigger piece of pie will get what was promised. The rest will hold out for greed and have nothing. Or something like what is happening in Venezuela, where there were zeros lopped off the amount they owned. That problem means that at some point, the exact moment no one knows, there will be a tipping point of non-confidence and some small player will stop trusting he or she will eventually be paid back what they’re owed. They will ask for a pay out now instead of holding out for a bigger amount. They will quietly be paid. Someone will see them be paid and get nervous and ask for their money pay out. And someone will see that. It will grow exponentially in demand because the globe is a complex system. So all is fine until a few people want to get off the ride. Then there will soon not be enough left to keep paying the amounts promised. For nations, the last item on a long list of derivatives is physical gold. When there is zero trust in a system then nations know they can use gold to trade for what they want and need. Gold is each nation’s real money. They trade it at their central bank’s bank, called The Bank for International Settlements. Gold is trusted because it can be melted and remelted. It is virtually indestructible, and after the initial mining which takes forever, it then lasts and lasts. It is not branded and is virtually indestructible. It is element 79. It is virtually inert. It is the same now as it was when it came from the stars, so it can be stored virtually forever without deteriorating. Individual homes are the same as nations when it comes to banking. They’re just not used to thinking about it that way now. If those with power come to the place where they see other nations and powerful players getting out of derivative trust arrangements and moving their physical money and gold close to home, they will begin to do the same as a protective measure. Everyone knows the game ends in tears and not everyone wins. But if they hold out they might get a little more than if they got out now. But it is not in their best interest to have everyone cash out into real money instead of promises to pay in the future. If more people want physical gold then the price of gold will go up. No one wants the price to be expensive when they buy it. To accumulate enough gold to protect yourself if the whole globe stops trusting the current financial system, you hope to accumulate the metal quietly before there is a rush to get what was promised now instead of holding on for later. The rush on gold will send the price up through the roof as the complex system is not just nation to nation now, but is globally interconnected. There will be a shortage as there isn’t enough gold at the current price to cover all the promises. You will be left still holding a handful of promises written on paper. Then the rules will be changed in something like a foreclosure. Pennies on the dollar for your paper promises to then be cashed out. Best to transfer those promises to hard, I-don’t-trust-you gold before the rest of the players start. Is this happening in the world? Have nations started buying I-don’t-trust-you physical gold? Yes, Russia and China have been quietly buying gold, and most recently increasing at a faster pace. Other nations, like Turkey, are also buying. Can a new system be created by the same players if the old one is faulty? Depends on who does the creating and on how bad the lack of confidence is. If the masses stop trusting they will panic and run to the banks to withdraw their ‘promise to pay’ bank balances into cash. The banks have created safeguards for themselves where they can freeze up accounts and drizzle out the cash owned by the depositors. Much has been written lately about bank bail-outs and bail-ins. If the world leaders see this coming what would we see them doing now? They would be making new allies, creating another system that will work if the present one stops. They will bring gold they own close to home and stop holding it in other nation’s hands. Do we see this? In spades. So why is gold quiet? Why is the world quiet? A concerted effort by those with power to keep the masses calm while they secure themselves financially would include the use of all media and methods at their disposal. All methods including all ways of communicating. All forms of persuation. All forms of gaslighting. Physical persuasion would come when the social and mental persuasion stopped working. More promises than ability to fulfill. Less and less trust in the current financial system to pay what is promised in the future. A fight over smaller and smaller amounts of money using trade wars, currency wars and sanctions. Increasing talk over who is allied with whom. Quiet meetings. Loud meetings. Each one benefits those attending. Each meeting is held to define who is in your wolf pack and who is not. What their strength or threat is to your pack. What has value and how to get more or it. Trust is devolving as the macro system is reaching it’s maximum swing of the pendulum. Expanding and contracting. When it starts to swing back the world will quickly jump into the only thing everyone can trust. The only thing that doesn’t change and doesn’t require trust. The bigger monetary world values gold. I’m currently in Vancouver, British Columbia. Just back from the Gold Rush Trail where I received my latest batch of beautiful pure gold flakes and small nuggets for the ‘Wild Luxury’ collection of pure natural gold jewelry. Working hard. Hiking in the wilderness. Out on Okanagan Lake (smoke, smoke, smoke from the wildfires).